Bicycle Tech: iPhones and Bicycling? …in which I add a smartphone component to bicycles and bicycling. As a technology fan, I like following along with all the cool ways in which technology is embedded in various things. At the risk of sounding somewhat hypocritical, I’m a fan of the “connected cars” movement. I think that there needs to be some sort of safety feature that disables user intervention with that tech when the car is in motion. But I generally like how cars are becoming more aware of their surroundings. I don’t have a car. I have a bicycle. Before I got my bicycle, I researched some software for bicycling and found that the iPhone’s marketing slogan is true here: there’s an app for that. I bought an iPhone mount for my bike and downloaded a couple cycle computer apps: Cyclemeter ($4.99) and BikeBrain (free download, $1.99 in-app upgrade). There’s one major caveat to the iPhone as a cycle computer: It uses GPS to calculate everything and there is a definite delay of about three seconds in the system. 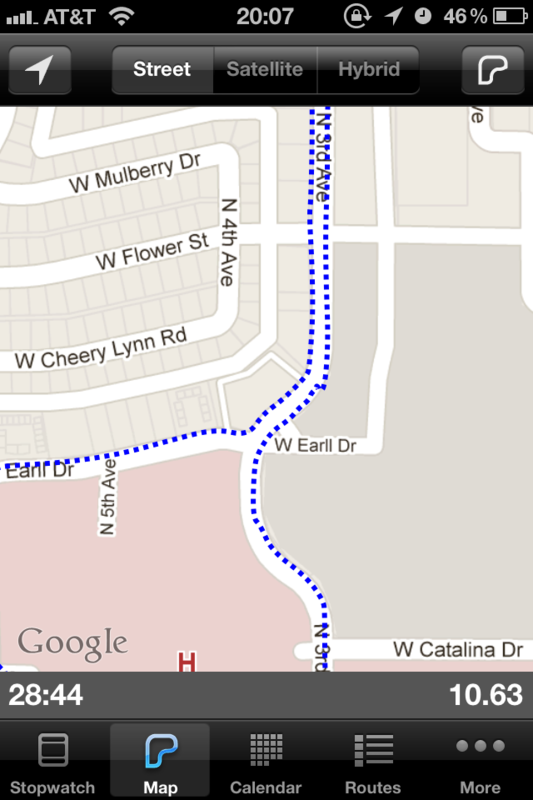 (That might not seem like much but 3 seconds traveling at 13 mph is about 60 feet in distance.) When you start your trip, you have to wait for the iPhone to receive GPS signals–and when it does, you’ll get some initially erroneous readings as the iPhone places where you are in space. Caveats aside, it’s still a good thing to have. I’m still testing out both apps. Cyclemeter is a very robust app that has a myriad of features beyond the basic functions of a cycle computer. Cyclemeter has a text-to-speech engine that will speak to you at pre-defined intervals of a distance or time. A very cool feature is that it will read you your Facebook notifications as they come in or Twitter replies and DMs. A lot of Cyclemeter’s features are for recreational or competitive cycling; for instance, one can define routes and have competitions against one’s self or against others. 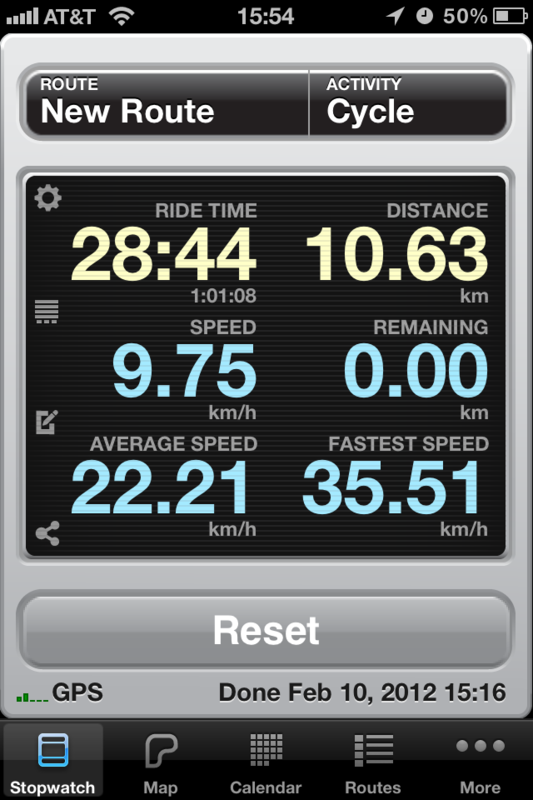 In fact, the screen captures I have in this post are from Cyclemeter. Both apps, because they are essentially GPS apps, will track your location and plot where you are and where you’ve been on a map. I think that Cyclemeter’s map is a bit more accurate. On a trip up and down 3rd Ave in midtown Phoenix, Cyclemeter mapped which side of the street I was on pretty accurately. There’s a tradeoff: to do that, Cyclemeter has to poll GPS signals rather frequently and that goes through your iPhone’s battery very quickly. BikeBrain’s map isn’t as detailed as Cyclemeter’s but I think that it’s because it doesn’t poll GPS position as frequently. As I learn more about both apps, I’ll share them here. What apps are you using to make your urban cycling experience more enjoyable? Or are you a purist and just enjoying all the scenery as it goes by, laughing because you’re in the environment instead of being in a metal box? Author Edward JensenPosted on 13 February 2012 Categories BicyclingTags bicycle computer, BikeBrain, connected bicycling, Cyclemeter, GPS, iPhone, iPhone bike mount, smart bicycling1 Comment on Bicycle Tech: iPhones and Bicycling?